We’ve recently written about the effect UX has on conversions. One place that has always had a lot of friction is the checkout process, particularly the manual entry of billing information on handheld devices. There have been several drives to reduce such friction in recent years, including Apple Pay, Android Pay, and Samsung Pay, to name a few. The goal is to reduce billing friction by eliminating checkout forms: lower friction means more conversions! The Payment Request API is an HTML5 specification that aims to provide frictionless payments on the open web. Payments on the web have always been tricky, usually involving inputting a lot of data, making it inconvenient, to third parties of variable or unknown trustworthiness, making it insecure. Some intermediary solutions like PayPal aimed to solve the problem by providing a single touch point for payments. The Payment Request API potentially offers an even better solution, that doesn’t require you to share your billing information with a third-party like PayPal. The API is not yet finalised, and there is much activity in the working group behind it. It’s already available to use in some browsers. Chrome for Android added support in version 53, and it can be enabled via experimental flags in Edge, Opera, and Chrome Desktop too. On iOS, there’s Apple Pay. This alternative and proprietary payment system has been available on Apple Devices since September 2014, but has only come to the web this year. Given this, it’s probably unlikely Apple will bring the Payment Request API to Safari in the very near future. 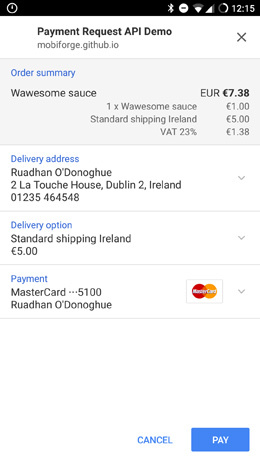 The first time using the Payment Request API was one of those magical, “Aha!” moments, where the cogs start spinning in your brain, going “wait a minute, how did it…” as you work out what happened. When building the example for this article, the first time I clicked the ‘Pay now’ button was one of these moments. 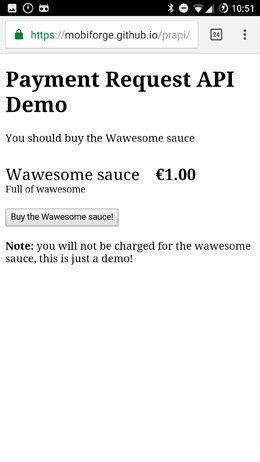 This said, as the name suggests, this is just an API for payment requests. It does not process payments. You will still need a traditional (or not so traditional) payment gateway to actually make payments. an API that allows [browsers] to act as an intermediary between the three key parties in every transaction: the merchant (e.g., an online web store), the buyer (e.g., the user buying from the online web store), and the Payment Method (e.g., credit card). Information necessary to process and confirm a transaction is passed between the Payment Method and the merchant via the [browser] with the buyer confirming and authorizing as necessary across the flow. In this article we’ll build out a basic example showing how to get up and running with the Payment Request API. We’ll hook it up to a simulated payment provider, that is, we’ll return a success or fail for the payment processing step to show how the API will handle these situations, but we won’t actually integrate with any particular payment provider. One point to note before trying to work through this example, is that, as you would expect for an API handling sensitive data, the Payment Request API is only available for secure contexts (i.e. HTTPS). There are some options for testing locally near the end of the article. The rest of the page here is really just about presenting product or purchase details to the user, in whatever way you like. In this example, we simply report that the API is not supported. In a real application, you should display a traditional checkout/billing form if the API is not supported, rather than turning down payments. The Payment Request API provides the PaymentRequest object for making payment requests. Let’s see what the methodData, details, and options parameters are. The methodData parameter contains a list of supported payment methods, e.g. An important point to note is that the Payment Request API doesn’t do any arithmetic validation of your data. That is, if the values in your displayItems do not add up the value in your total, the API is not going to tell you. It doesn’t care what numbers appear here, so it’s the responsibility of your application to ensure that the numbers are correct. At this point we can call payment.show(). This will show the payment request UI to the user, and the user can add or amend details, and ultimately accept or reject the payment. 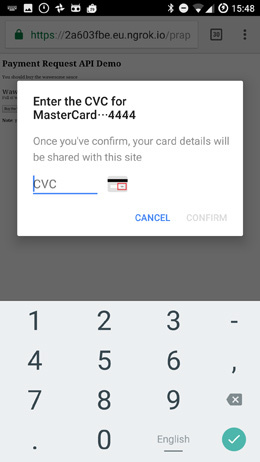 Note in particular that it has magically pulled in the credit cards stored on my phone (more on this later), and presented them in a clean and user-friendly interface, ready to be selected without having to manually enter any details into a form. Now we’re ready to try to put the payment through. Depending on the response from the payment gateway, success or failure, we’ll want to do something different. 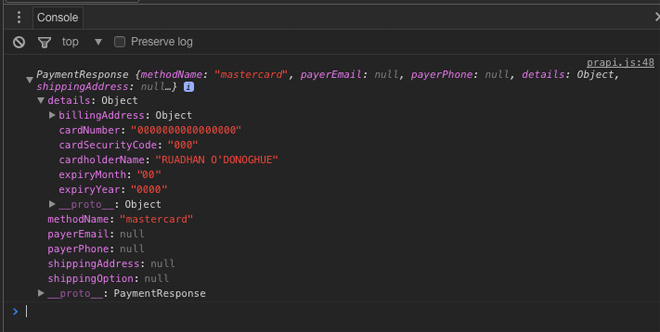 We use the paymentResponse.complete() method to close the Payment Request UI. This method takes a string argument of success, fail, or "" (i.e. empty). In the case of success or fail, the API specification says that a success or fail UI may be shown. However, where the case of the empty string, the web page didn’t indicate a success or a fail result, and so neither a success nor a fail UI should be displayed. In this example, our we simulate a payment gateway with a simple local page that always returns an HTTP 200 OK code. That is, it always comes back successful. Finally, we can catch any unexpected errors too, and report a fail in this case. So that completes the first part of the example, and you might agree that the API is relatively easy to use and intuitive. But our example was somewhat simplified, in that it didn’t really look at shipping, and we accepted orders from any address. This won’t be practical in many cases. Thankfully the API lets us define multiple shipping methods that will be available for different locations. As with the choice of credit cards payment options, the payment UI presents the shipping options in a simple and user-friendly choice. Note that we now make use of the updateWith method in both cases. This is a method provided by the API that should be used to update the payment request, and it should return a promise that resolves with updated details. The updated details should then be presented to the user. So in this example, we write two functions handleAddressChange and handleOptionChange to achieve this. However, before we get to these functions, the API gets a little unintuitive here. There are a couple of things to watch out for. The shippingaddresschange event won’t be fired if the shippingOptions property of the request is not empty or undefined, which seems kind of odd. This means that if you want to have different options available or prices calculated based on location or country, then you don’t pass them in with the request like we did just a minute ago, but build them instead in the event handling code. In our example, we’ll provide Standard and Express options, and each will have a different cost based on country (Ireland vs international). So we’ll have four delivery options, two for each location. 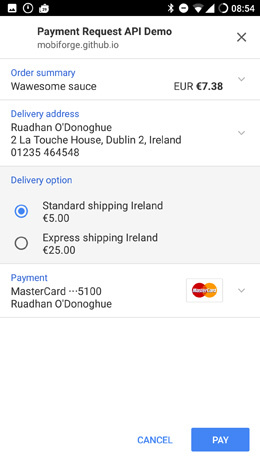 The code above should explain itself: we define two shipping options for Irish addresses, two options for the rest of the world, and no options for the US. We then set the default shipping option to standard shipping, and update the order summary (displayItems). Now’s a good time to come up for some air and see where we are. At this point, we can handle the event when the user changes address, we’ve recalculated the total order cost based on shipping costs, and recalculated tax, we’ve updated the items displayed in the order summary based on these new costs, and we’ve displayed the shipping options available for the chosen address, if any. 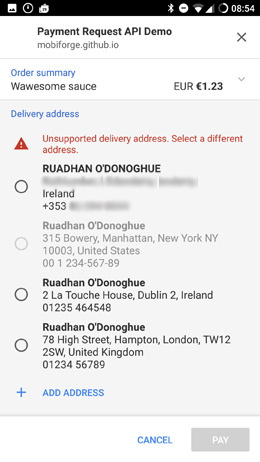 In the images below we can see the default UI for an unsupported address: this happens when we choose the US address that we don’t deliver to. We also see the result of choosing a supported address, with the default shipping method added to the summary, and the costs recalculated. So we still have to handle the situation when the user selects a different shipping option, Standard vs Express for Irish or International orders. In this example, we only have one actual product in the order, the other items are shipping and tax. So we remove everything from the order apart from the product, and then we match the correct shipping option, and add that back to the order. Then we call the updateDetails function that we saw earlier. This function will then calculate the tax and totals and we’re done! Finally, we can click the Pay button. 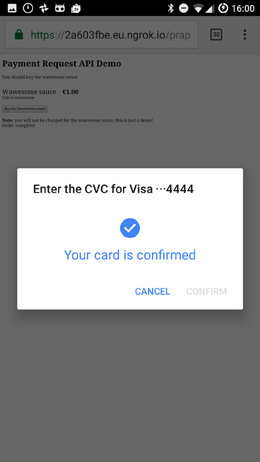 When this happens, the Payment Request API will prompt for CVC number and attempt to validate the card. And that’s it! You can view the demo here, and you can find all the code on github here. 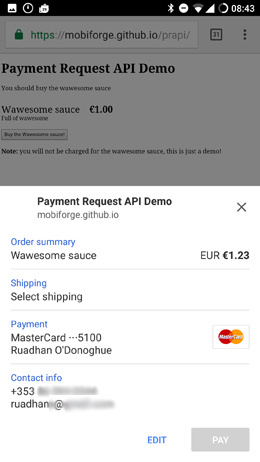 Right now the Payment Request API is only supported in Chrome for Android (even Chrome for desktop not yet supported). 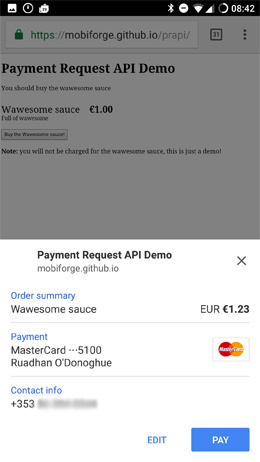 Right now the Payment Request API is officially shipped in Chrome for Android, and Samsung Internet browsers. It’s also currently under development in Firefox, Opera and Microsoft Edge, and is available to preview in Edge, Opera, and Chrome Desktop browsers via experimental flag. Unless you are developing only for MS Edge or Chrome Desktop, then you’ll need to test on a mobile device. If you’re developing and deploying to your local server, ngrok is indispensable, giving you a tunnel through to your local machine. It supports HTTPS, so anything requiring a secure origin, such as this API, can be tested. Additionally, using Chrome dev tools remote device debugging is very handy for this (and any other) mobile web development. So, where did it pull my credit card details from anyway? My Google account: I’m logged into Google on my device, and in Chrome. My credit card is attached to that account, so if Google Play can access my card, why not Chrome too? Seems plausible! Chrome’s auto-fill feature I checked this on two different devices, and indeed my card and shipping address were stored under auto-fill settings in Chrome. So where did the API pull the data from? Well it turns out from both places! I performed several tests on two different devices. I was logged in with my Google account on both devices and in both browsers. On one device however, there were no cards stored in the auto-fill section. On this device the Payment Request API did not have any payment methods to choose from, the only option was to add a credit card. After adding a card to auto-fill, the Payment Request API did indeed find this card. This would appear to indicate that the card was being pulled from the browser auto-fill feature. However, subsequently disabling auto-fill had no effect on the APIs ability to find the card. I would have expected that the card should not be found if auto-fill was disabled. I’m not sure if this is a bug or not! 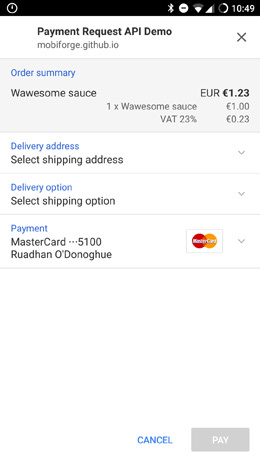 I also decided to try to add a card directly via the Payment Request API UI, via the ‘Save card to device’ checkbox, rather than adding the card via auto-fill UI. After adding the card via the API, checking back in auto-fill confirmed that this is where the card was saved. So it does appear that auto-fill is where the card is being saved, and that auto-fill is definitely being leveraged by the API. Finally, reviewing the auto-fill settings on the other device revealed that one card was tagged with “Google Payments”. 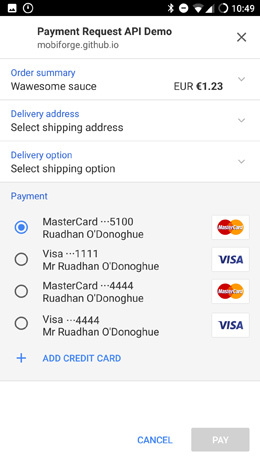 So my Google account card was pulled into auto-fill, and the Payment Request API was able to access it there. This card was not editable via the auto-fill interface, while the others were! Security is an understandable concern given the nature of this API. As with many new advanced HTML5 features, this API is only available over secure contexts. But even more with this API people might ask what happens if their phone is lost or stolen? Will unauthorised access to a user’s device provide unauthorised access to their credit cards and other payment methods? Since one or more credit cards are accessible via the device, should these cards be reported as lost? Thinking through various scenarios, it would seem that having on-device Payment Request API support, or even browser auto-fill functionality, is no less secure than carrying a credit card around in your pocket. Perhaps it is even a little more secure, since the API will prompt for the CVC number during transactions, whereas this information is printed directly on the back of a card. On the other hand, a credit card does not include shipping information on its back, whereas this information can be accessed from the device. If I want to change the credit card details associated with my Android account, I need to provide a password. Even to view the details, I need a password. This doesn’t seem to be the case with the Payment Request API: I can pick up my device, and go to the Chrome auto-fill settings and browse the credit cards registered there. But perhaps this is more an issue with the use of Chrome’s auto-fill rather than with the API itself. These concerns aside, this API provides a streamlined and mostly frictionless way to facilitate mobile payments. It’s relatively easy to implement, and is certainly user-friendly. Whether or not users will have to call their credit card company when their phone is stolen is unclear to me, although I’m sure the W3C team behind this API have given more thought to security issues than I have.